We are now less than a week away from Australian Nationals 2018, and with the very recent release of Core Set 2019, the stakes could not be higher. Preparation time is at a premium with only a week between the set’s public release and Day One of the event. At Draftaholics Anonymous, we’ve put together our annual Draftaholic’s Guide to Standard for anyone looking to get an edge for Nationals. From the newest player, to the most experienced grinder, this guide will help you understand the ins and outs of standard, the cards to look out for, the decks to play and the decks to beat. Read on, and let’s learn together! With the release of Core Set 2019, there is no other place to start than arguably the biggest, baddest villain in magic lore, Nicol Bolas. The latest magic set has breathed life into the slumbering Grixis archetype with several variations looking to utilise efficient removal spells and curve into Nicol Bolas, the Ravager and The Scarab God to close out games. 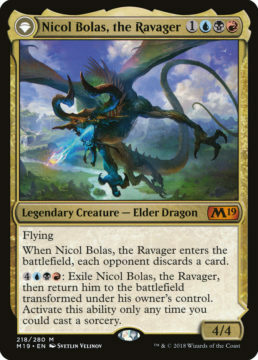 Nicol Bolas, the Ravager offers the deck a very powerful win condition that also accrues value when your opponent is able to answer it. The enters the battlefield ability that forces your opponent to discard a card can allow the second (or third!) Nicol Bolas to run away with the game. Differing lists may utilize the energy mechanic with cards such as Glint-Sleeve Siphoner, and Harnessed Lightning, or may look to control what their opponent is trying to do with Supreme Will, Disallow or Torrential Gearhulk. As this archetype can suffer from missing land drops or colours of mana, Champion of Wits and Arguel’s Blood Fast are included to smooth out your draws. – Having 6 creatures in the graveyard for Gate to the Afterlife. – Digging through your deck for Trophy Mage and the Gate with cards like Stitcher’s Supplier or Champion of Wits. This deck is powerful because it’s able to cheat on the mana cost for the God-Pharaoh’s Gift and produce an almost endless swarm of creatures from the graveyard, providing inevitability. Some flavours of GPG are able to win games just by casting its creatures, many of which generate value when they enter the battlefield, such as Angel of Invention. 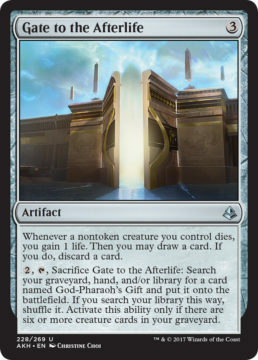 Current iterations of this list are able to abuse the power of Stitcher’s Supplier to power out six creatures in their graveyard as early as turn two or three, enabling the Gate to the Afterlife to find the GPG. The deck is vulnerable to artifact removal spells like Abrade and Naturalize if combined with pressure from an opponent. Graveyard interaction such as The Scarab God or Deathgorge Scavenger can slow down this deck, as it will take more time to set up. This deck is most powerful in a meta with a lack of main deck cards which interact with artifacts or graveyards. Mono Red is a traditional archetype that has existed at many points during Magic the Gathering’s rich history; most recently it’s significant presence at MTG Nationals 2017. Despite losing key cards Ramunap Ruins and Rampaging Ferocidon to bans, the deck remains a tier 1 archetype. This archetype is known for its aggression, as it is able to play efficient creatures along the curve. The deck starts with Bomat Courier, then through to Ahn-Crop Crasher, and tops off its curve with Hazoret the Fervent. 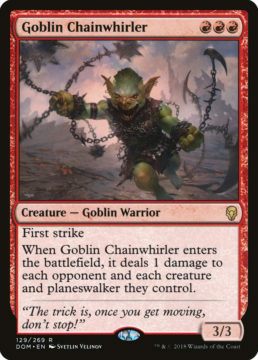 Special mention goes to Goblin Chainwhirler who has survived a ban scare. Most lists have a variety of multi-purpose removal spells such as Lightning Strike or Shock which can target creatures or players, or Abrade to have the flexibility to deal with problem artifacts. Red Black was the deck to beat for the majority of the Dominaria standard season. While it took a few weeks to establish its dominant metagame percentage, it did so in a big way at GP Birmingham, and maintained dominance throughout the season. 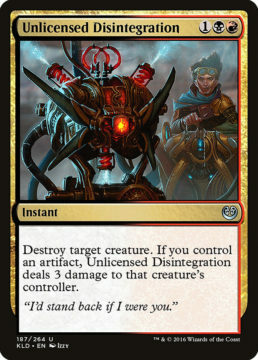 The deck adopts many cards from its mono red cousin, but supplements it with an additional colour of mana for more recursive threats like Scrapheap Scrounger, versatile removal such as Unlicensed Disintegration, and discard spells in the sideboard such as Duress and Doomfall. RB’s strength comes from its ability to present itself as a deck that can exist as any level of aggro or midrange, yet adjust with the sideboard to what the match-up requires. This creates the daunting task for opponents of being prepared for both angles in game one as well as guessing the post-board plans. However with the addition of a colour, the deck is forced to play a shakier mana base with tapped lands that hinder the ability to curve as consistently as mono red. Only time will tell whether this deck is able to maintain its tier 1 status with the release of M19. 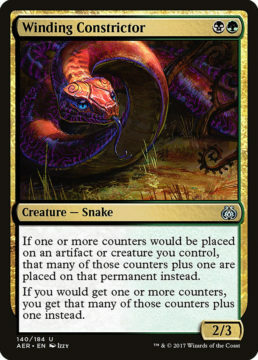 Green/Black Constrictor is, in essence, a midrange deck that utilises some of the best removal spells available in standard, alongside creatures that generate additional value. The best ways to combat GB are with sweepers to stall their early aggression. GB can struggle to keep up with decks that go wide with multiple creatures as it is often building up power and toughness, and one-for-one removal isn’t as effective to deal with multiple opposing creatures. GB also has a tough time in game one against control decks with counterspells and few creatures, as its removal spells will be dead draws. 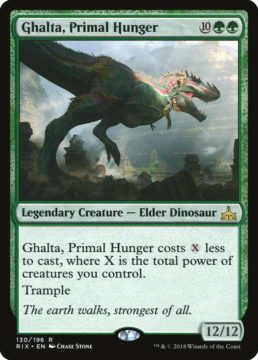 Mono Green Stompy is an aggressively slanted deck which harnesses a primarily green mana base to cast Steel Leaf Champion and Ghalta, Primal Hunger, alongside other powerful creatures to close out games very quickly. This archetype can use Llanowar Elves to cast Steel Leaf Champion as early as turn two, alongside cards such as Heart of Kiran, Greenbelt Rampager and Rhonas the Indomitable to put pressure on your opponent’s life total. Blossoming Defense is the deck’s primary choice of interaction, providing protection to your big green creatures to ensure they connect, and essentially act as a counterspell for removal. Green can be susceptible to other decks overloading the creatures with removal spells which could leave Ghalta stranded in hand; or board-sweepers removing several creatures from play. Control tries to (surprisingly) control the game with a range of removal spells such as Vraska’s Contempt or Fatal Push, combined with counterspells such as Essence Scatter or Disallow. 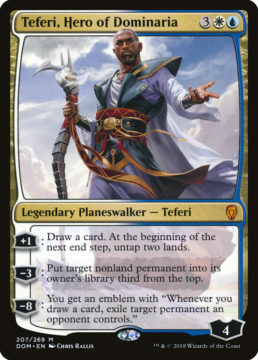 When control of the game has been established, it then looks to win the game with one of its multiple win conditions such as Teferi, Hero of Dominaria, The Scarab God or Torrential Gearhulk. This deck can be susceptible to a stretched mana base, which requires a large range of colours on various turns, and as such has primarily limited the requirements for white mana to just Teferi. 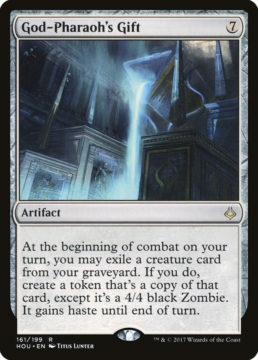 Typical lists will run Glimmer of Genius and Commit//Memory to ensure that this mana base is smoothed out, and all spells can be cast on time. Thanks to our standard experts! This concludes our ‘Guide to Standard’ series for MTG Nationals 2018. Thanks to Trent, Julian, Chifley, Tim for their work with producing the video deck techs, and special thanks to Nathan for compiling all the information into this article. Now go. Get testing. Get training. Win! Previous Previous post: P1P1 Core Set 2019 is up! Get picking! Next Next post: P1P1 Guilds of Ravnica is up! Get picking!